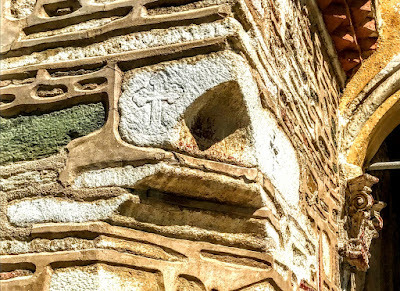 Sunday next [28 April 2019] is the Second Sunday of Easter, often known as Low Sunday. The Readings: Acts 5: 27-32 or Job 42: 1-6; Psalm 118: 14-29 or Psalm 150; Revelation 1: 4-8; John 20: 19-31. The Second Sunday of Easter is traditionally known as Low Sunday. 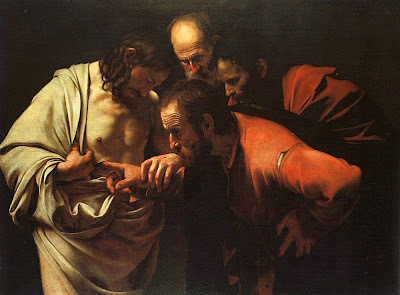 In the past this Sunday has also been known as Saint Thomas Sunday, because the Gospel reading recalls the story of ‘Doubting Thomas,’ and also as ‘Quasimodo Sunday’ or Quasimodogeniti. 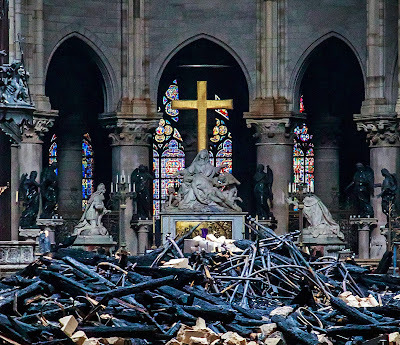 The name Quasimodo comes from the Latin, quasi modo (‘as if in [this] manner’) and the text of the traditional Introit for this day, which begins: Quasi modo geniti infantes, rationabile, sine dolo lac concupiscite, ut in eo crescatis in salutem si gustastis quoniam dulcis Dominus, ‘As newborn babes desire the rational milk without guile, Rejoice to God our helper. Sing aloud to the God of Jacob’ (see I Peter 2: 2). In other words, the Resurrection has given us the gift and the promise of new birth. In many places, this Sunday is known as Low Sunday. 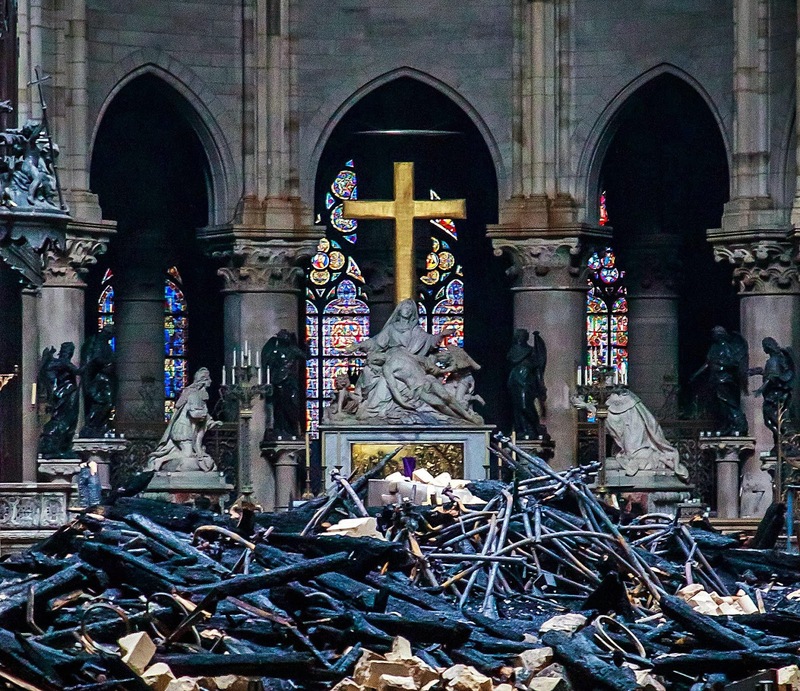 Some say it was called ‘Low Sunday’ because today’s liturgy is something of an anti-climax after the solemn Easter liturgy and celebrations a week earlier. Some even joke that today is known as Low Sunday because this is the Sunday choirs take off after their hard work during Holy Week and Easter. In the Eastern Churches, this day is known as Thomas Sunday, because of the dramatic story about the Apostle Thomas in our Gospel reading on this morning. 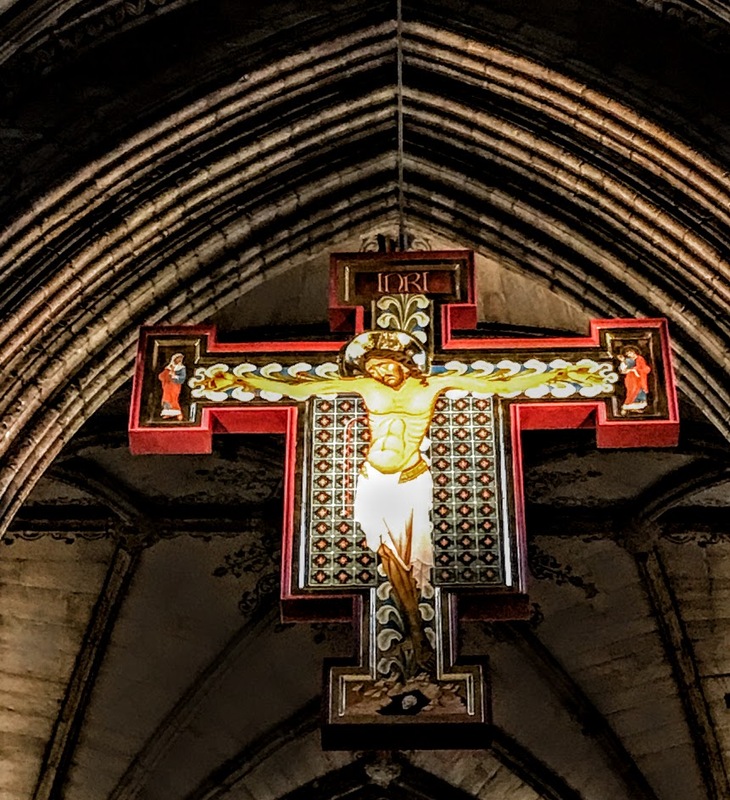 This posting looks at the Lectionary readings, and also offers an alternative reflection, built around the theme that next Sunday is also known as Quasimodo Sunday. In the previous chapter in the Acts of the Apostles, Saint Peter and Saint John were arrested and ordered not to speak or teach in the name of Jesus. But the Sanhedrin did not punish them, they were freed, and they returned to the Temple to preach. Once again, they are arrested and brought before the council (verse 27). Now the high priest says the apostles are determined to place the blame for Jesus’ death on the religious authorities (verse 28). Peter and the apostles reply, insisting they must obey God rather than any human power (verse 29). They explain that God has raised the crucified Jesus from the dead. They are witnesses to these things and through the gif of the Holy Spirit they have been obedient in proclaiming these truth (verses 30-32). A portion of this Psalm was one of the readings available the previous Sunday too, on Easter Day (Psalm 118: 1-2, 14-24). The second half of Psalm 118 praises God for his deliverance and salvation. but he did not give me over to death (Psalm 118: 17-18). Now he can enter the Temple (verse 19) to give thanks to God (verse 20). He has suffered greatly, but God has preserved his life. has become the chief cornerstone’ (Psalm 118: 22). In the Acts of the Apostles, Saint Peter speaks after his arrest to the Sanhedrin of the Risen Christ, describing him as ‘the stone that was rejected by you, the builders; [he] has become the cornerstone’ (Acts 4: 11). Saint Paul too refers to Christ as ‘the cornerstone’ (see Ephesians 2: 20). Once again, we are reminded, Easter is a time to rejoice and be glad. The Psalms end with a psalm that gives praise to God (Psalm 150), beginning and ending with ‘Hallelujah!’ – a phrase that is more powerful than the translation ‘Praise to the Lord!’ (Psalm 150: 1, 6), which seems almost insipid as we rejoice in the Easter joys of the Resurrection. This psalm also calls on the hosts of heaven to praise God throughout the universe. He is to be praised for his mighty deeds and his great goodness. And in praising God we are to use every instrument available to us. Easter should be the most joyful of all times. 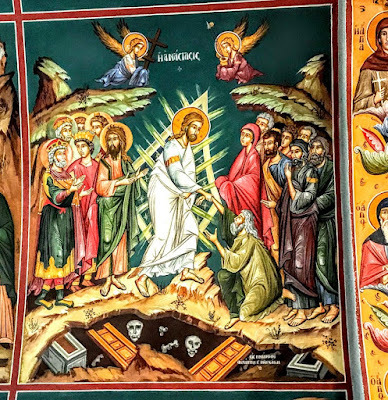 For the next few weeks, for the six Sundays from this Sunday (Easter II, 28 April 2019) to the Sunday after Ascension Day (Easter VII, 2 June 2019), the RCL invites us to explore the Book of Revelation through a selection of readings. This is a wonderful opportunity to introduce parishes to this book, and to spend a few weeks introducing parishioners to the riches of this book, one of the great pieces of literature. The Book of Revelation is often feared, regarded as a work full of apocalyptic imagery that we shy away from with our modern mindsets. Yet, if we leave it aside, we not only miss out on a captivating piece of Biblical literature, full of poetry, drama, imagery and challenge, we also leave it those who misinterpret it and misuse it to bolster what are frankly weird and marginal religious and theological views, or for those who have extreme religious views. Yet it is a wonderful aspect of Biblical literature that the Bible should open with the account of creation in the Book Genesis, and close with the beautiful description in the Book of Revelation of God’s plans for that creation – God’s plans for a New Heaven and a New Earth. The Book of Revelation is also known as the Revelation to John, the Apocalypse of John (Greek, Ἀποκάλυψις Ἰωάννου), or the Revelation of Jesus Christ. 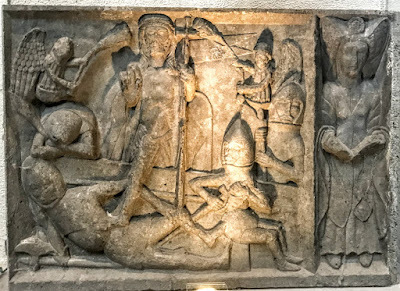 The title on some of the earliest manuscripts is ‘The Apocalypse of John’ (Ἀποκάλυψις Ἰωάννου), and the most common title on later manuscripts is ‘The Apocalypse of the Theologian’ (Ἀποκάλυψις τοῦ Θεολόγου). Some later manuscripts add Evangelist or Apostle to the title. This is the last book of the New Testament, and the only New Testament book that is wholly composed of apocalyptic literature. It is a fitting close to the New Testament, and to the whole Bible, for it depicts the consummation towards which the whole Biblical message of redemption is focussed. This book has been described as ‘an inspired picture-book,’ it draws on magnificent poetic imagery, and it makes a powerful appeal to imaginations of its readers. Saint John begins and ends this book as a letter, written ‘to the seven churches that are in Asia’ (Revelation 1: 4), a Roman province in western Asia Minor or Anatolia, in what we know now as the west coast of Turkey. He begins by greeting the seven churches with a blessing of grace and peace, drawing on both Greek and Hebrew blessings, from the eternal God, who is, who was and who is to come. The Crucified and Risen Christ has freed us from our sins, has made us a kingdom of priests serving God the Father, and he is coming again. All this is proclaimed in the name of the Lord God, who is the Alpha (A) and the Omega (Ω) – the A to Z, as we might say today – the beginning and end of all things, the Lord God Almighty who is, who was, and who is to come. For an introduction to and synopsis of the Book of Revelation prepared for students in 2010, visit HERE. Thomas wants to see, hear and touch. He wants to use all his learning faculties before he can believe this story. 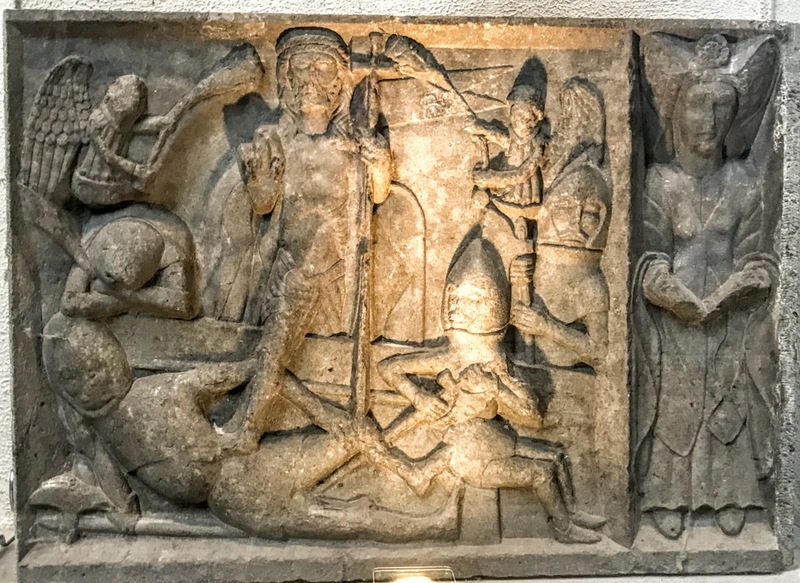 See, hear and touch – if they had manuals then as we now have, I am sure Thomas would have demanded a manual on the resurrection too. Victor Hugo’s novel The Hunchback of Notre Dame was originally published in French under the title Notre-Dame de Paris in 1831, and was translated into English by Frederic Shoberl in 1833 as The Hunchback of Notre Dame. 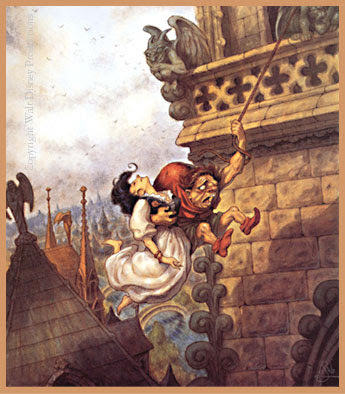 Notre Dame’s bellringer, Quasimodo, the sad hero in Victor Hugo’s novel, was abandoned as a new-born baby in Notre Dame Cathedral in Paris on this Sunday, and so was given the name Quasimodo by Archdeacon Claude Frollo who found him. 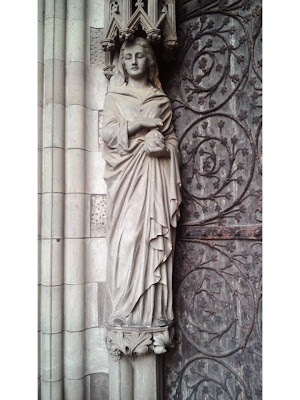 For an Easter Day sermon on Notre Dame Cathedral in Paris visit HERE. Readings: Acts 10: 34-43 or Isaiah 65: 17-25; Psalm 118: 1-2, 14-24, or the Easter Anthems; I Corinthians 15: 19-26 or Acts 10: 34-43; and John 20: 1-18 or Luke 24: 1-12. This posting looks at Saint John’s account of the Resurrection, but also asks how this Gospel reading fits in with the other Lectionary readings for Easter morning, and what makes the account in the Fourth Gospel different from the Resurrection accounts in the other three Gospels, in particular the optional reading from Saint Luke’s Gospel. 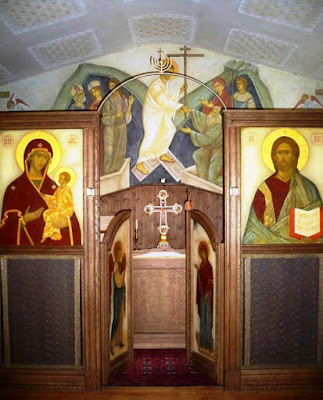 There is a link to the reading from Saint Luke’s Gospel HERE. The Book of Isaiah is divided into three parts. Chapters 40 to 66, written during and after the Exile in Babylon, are filled with trust and confidence that God will soon end the Exile. Chapters 56 to 66, sometimes known as ‘Third Isaiah,’ were written after the return to the Promised Land. These chapters speak of the hope that God will soon restore Jerusalem to its former glory and make a new home for all peoples. This reading opens with the hope that God will completely transform the cosmos, turning it into a ‘new heavens and a new earth’ (verse 17), in which the people of the new Jerusalem will be joyful (verse 18), where sorrow will cease (verse 19), and they will be blessed with long life (verse 20). Life will be stable, harvests will be plentiful, and God will bless his people (verses 21-23). People will return to a life free of sin that God originally intended them to live. All will be at peace in ‘my holy mountain,’ the new Jerusalem (verse 25). All conflicts will cease, and we shall live in harmony. let us rejoice and be glad in it’ (Psalm 118: 24). In this psalm (Psalm 118: 1-2, 14-24), we are called to give thanks to God for his mercy and love, which are everlasting. The one who was rejected is now God’s chosen ruler, and all shall share in the power and blessing of God. This is the day to rejoice and be glad. This Epistle reading (I Corinthians 15: 19-25) continues after the earliest account of the Resurrection we have in the New Testament (verses 3-8). The Apostle Paul has heard that some people in the Church in Corinth deny the physical resurrection of the body, claiming that only the spirit matters. Here he argues against this view. He tells the people in Corinth that Christ’s resurrection is a sign or promise of what is going to happen to us. 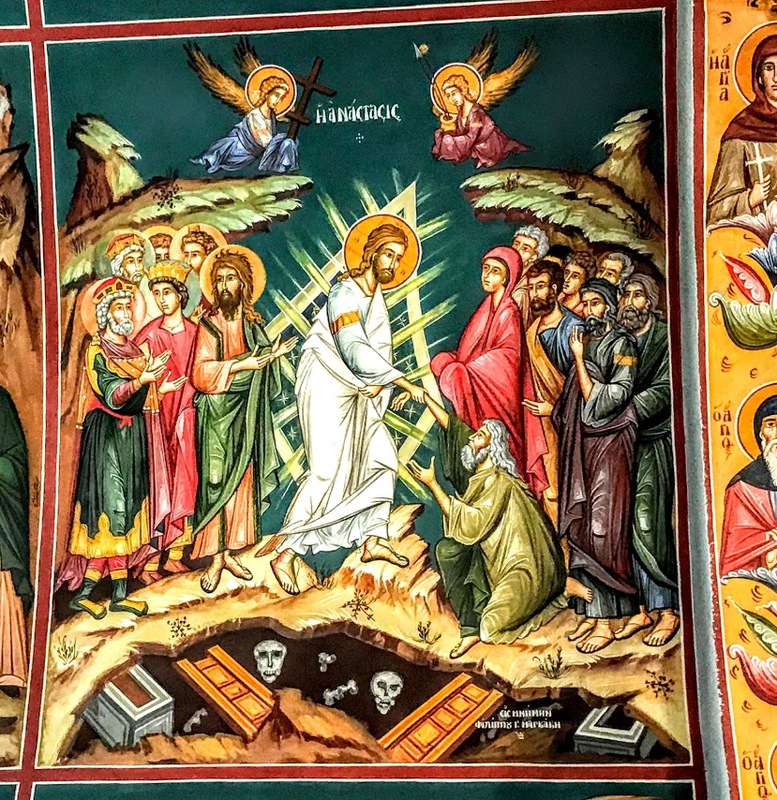 Christ’s resurrection marks the destruction of all that is hostile and ungodly, and a sign of the coming Kingdom of God. Despite the complicated presentation of the reading options in the Revised Common Lectionary, the expectations in the RCL and the guidelines in the Church of Ireland Directory are that the reading from the Acts of the Apostles will be read on Easter Day. In verses 36-38, Saint Peter summarises Christ’s earthly ministry and applies prophecies in Isaiah (52: 7 and 61: 1) to Christ. Christ is Kyrios, the ‘Lord of all’ (verse 36). In Baptism, the Father ‘anointed’ Christ (verse 38) ‘with the Holy Spirit’ and with the ‘power’ of God. The good news (‘message,’ verse 37) spread throughout Palestine (‘Judea’). He ‘went about’ (verse 38) ‘doing good’ and combatting evil, doing deeds so powerful that it is clear that he was God’s agent: he is a model for all to follow. In the Eastern Orthodox tradition, these women are known as the Holy Myrrhbearers (Μυροφόροι). The Myrrhbearers are traditionally listed as: Mary Magdalene, Mary, the mother of James and Joses, Mary, the wife of Cleopas, Martha of Bethany, sister of Lazarus, Mary of Bethany, sister of Lazarus, Joanna, the wife of Chuza the steward of Herod Antipas, and Salome, the mother of James and John, the sons of Zebedee, and Susanna, although it is generally said that there are other myrrh-bearers whose names are not known. 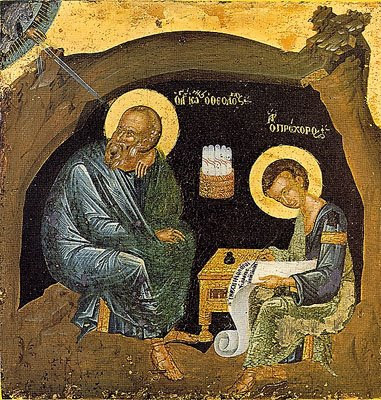 In the alternative reading in Saint Luke’s Gospel (Luke 24: 1-12), Joseph of Arimathea has wrapped the body of Jesus in a linen cloth and has laid it hastily in a new tomb (23: 53). ‘The women who had come with’ Jesus from Galilee ‘followed, and they saw the tomb and how his body was laid’ (23: 55). They prepared ‘spices and ointments’ ( 23: 56) to give him a proper burial, which was not possible because of the Sabbath. Now, early on Sunday, ‘the first day of the week’ (verse 1), they come to the tomb with their spices to. Later in this reading, the women in this group are named as Mary Magdalene, Joanna, Mary the mother of James, and ‘other women with them’ (verse 10). In the other Gospel readings, these women are named as ‘Mary Magdalene and the other Mary’ (Matthew 28: 1), ‘Mary Magdalene, and Mary the mother of James, and Salome’ (Mark 16: 1), or just ‘Mary Magdalene’ on her own (John 20: 1). There are no women in this group on Easter morning who become the first witnesses to the Resurrection. These women expect to find the tomb closed with a rock rolled in front of it, but, to their surprise, the tomb is open and the body is gone (verse 3). Suddenly, ‘two men in dazzling clothes’ stand among this small group of women (verse 4). The women are terrified at the sight of these divine messengers, and bow their faces to the ground (verse 5). But the two figures ask the figures ask then why they are seeking the living among the dead. Christ is not in the grave, he has risen from the dead, as he said he would (verse 6-7). The word translated ‘remember’ in verses 6 and 8 (μνήσθητε), means to bring to bear in the present, with power and deep insight, the meaning of past actions and words in God’s plan of salvation. It has the same roots as the words for remembrance (ἀνάμνησιν) used a few days earlier by Christ at the Last Supper: ‘Do this in remembrance of me’ (Luke 22: 19). Remembering Christ’s promises, and making it real in their lives this morning, the women return from the tomb, and tell the disciples all that has happened this morning (verse 9). 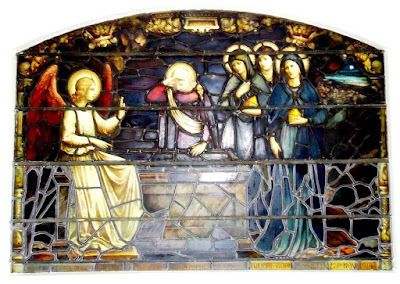 It is these women who first proclaim the Easter Gospel (vv. 9-10). But the apostles do not believe what the women say, it seems too much like an ‘idle tale’ (verse 11). Peter gets up and goes to see for himself, but he still lacks the sight of faith, and all he sees is the empty tomb and the folded grave clothes (verse 12). He goes home, ‘amazed at what had happened’ (verse 12). 1 But on the first day of the week, at early dawn, they came to the tomb, taking the spices that they had prepared. 2 They found the stone rolled away from the tomb, 3 but when they went in, they did not find the body. 4 While they were perplexed about this, suddenly two men in dazzling clothes stood beside them. 5 The women were terrified and bowed their faces to the ground, but the men said to them, ‘Why do you look for the living among the dead? He is not here, but has risen. 6 Remember how he told you, while he was still in Galilee, 7 that the Son of Man must be handed over to sinners, and be crucified, and on the third day rise again.’ 8 Then they remembered his words, 9 and returning from the tomb, they told all this to the eleven and to all the rest. 10 Now it was Mary Magdalene, Joanna, Mary the mother of James, and the other women with them who told this to the apostles. 11 But these words seemed to them an idle tale, and they did not believe them. 12 But Peter got up and ran to the tomb; stooping and looking in, he saw the linen cloths by themselves; then he went home, amazed at what had happened. Holy Week begins on Palm Sunday, which falls this year on 14 April 2019. The readings and liturgical resources for Palm Sunday can be found in the posting earlier this morning HERE. 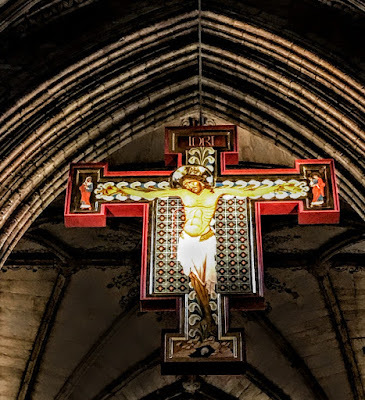 However, finding the readings and resources for the rest of Holy Week can be a difficult task that involves turning to different sections in the Book of Common Prayer, the Church Hymnal, the Church of Ireland Directory and Bishop Darling’s Sing to the Word – all at one and the same time. This posting is designed to help clergy and readers in the Diocese of Limerick and Killaloe and the Diocese of Tuam, Killala and Achonry to find all these resources in one package. It is recommended that the canticle Gloria is omitted in Lent. Good Friday and Saturday: No liturgical colours should be used. Isaiah 42: 1-9; Psalm 36: 5-11; Hebrews 9: 11-15; John 12: 1-11. Isaiah 49: 1-7; Psalm 71: 1-14; I Corinthians 1: 18-31; John 12: 20-36. Isaiah 50: 4-9a; Psalm 70; Hebrews 12: 1-3; John 13: 21-32. It is traditional in dioceses too to have a celebration of the Chrism Eucharist in a cathedral or church in the diocese, when the bishops, priests, deacons and readers renew their vows. 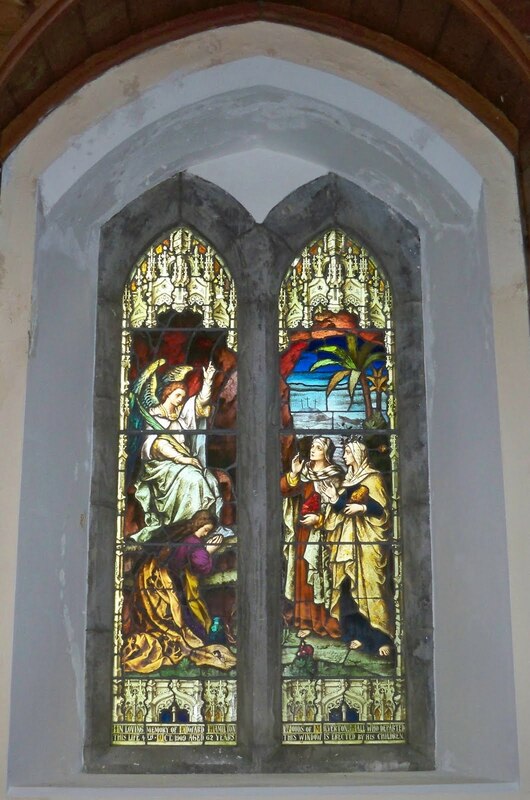 This year in this united diocese, the Chrism Eucharist is being celebrated in Saint Columba’s Church, Drumcliffe, Ennis, Co Clare, at 11.30 a.m.
Other possible resources for Maundy Thursday include foot-washing, which was introduced to Castletown Church, Kilcornan (Pallaskenry) two years ago. There are full resources for this in Bishop Miller’s Week of All Weeks. Readings: Exodus 12: 1-4 (5-10), 11-14; Psalm 116: 1, 10-17; I Corinthians 11: 23-26; John 13: 1-17, 31b-35. Isaiah 52: 13 to 53: 12; Psalm 22; Hebrews 10: 16-25 or Hebrews 4: 14-16, 5: 7-9; John 18: 1 to 19: 42. In the evening: John 19: 38-42 or Colossians 1: 18-23. 230, My Lord, what love is this? 234, O Love divine! What hast thou done? Job 14: 1-14 or Lamentations 3: 1-9, 19-24; Psalm 31: 1-4, 15-16; I Peter 4: 1-8; Matthew 27: 57-66 or John 19:38-42. No Post Communion is provided for this Saturday. 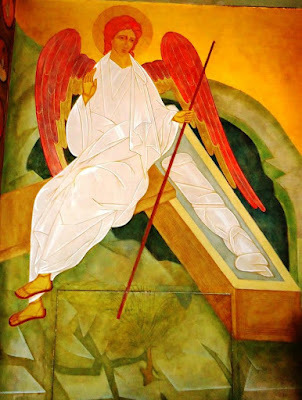 The celebration of Easter may begin after sundown with the Easter Vigil or the Midnight Eucharist on what is liturgically Easter Sunday, although it is still Saturday evening in the calendar.